The going get tough with the TaskMaster Deluxe Workbench Chair. Difficult tasks don't stand a chance. With a 15 year warranty, the TaskMaster Deluxe offers a 5-star, nylon base, 3-piece telescoping dust cover and high-impact nylon glides. Includes 20" dia. chrome-plated foot ring. 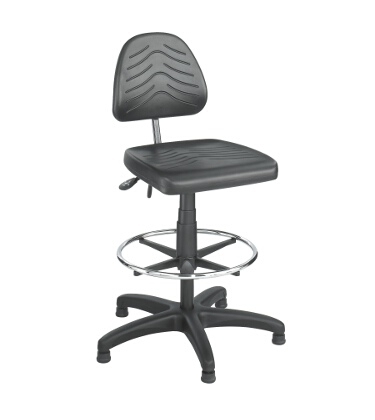 Contoured, over-sized seat design, backrest tilt and height adjustments. Seat cushion depth of 2-1/2". Seat has a 10º seat tilt with paddle lever. Backrest has paddle lever control for 22º backrest tilt and ergo knob adjustment for 5" backrest height. Also features black microcellular, self-skinning polyurethane foam seat and back. Assembly required.